Description This timeline lists some of the more famous 20th century philosophers, showing how their lives overlapped in time. It was automatically drawn in RFFlow from the data. There are three styles of timelines that can be automatically drawn in RFFlow. The above timeline is the Bar Chart Timeline style. That style puts events in bars extending from the start to the end dates. The timeline bars are on the top and bottom. The other two timeline styles are the Rectangle and Line Timeline and the Criminal Analysis Timeline. We chose the option to not show the date or time with the event. The standard rectangle option was selected and we chose to not number the events. RFFlow provides a large number of options you can use to customize your timeline. Once the timeline is drawn, you can then edit it like any other RFFlow diagram. This allows you to move shapes, edit text, change colors, etc. Drawing Instructions First download the free trial version of RFFlow. It will allow you to open any timeline or chart and make modifications. 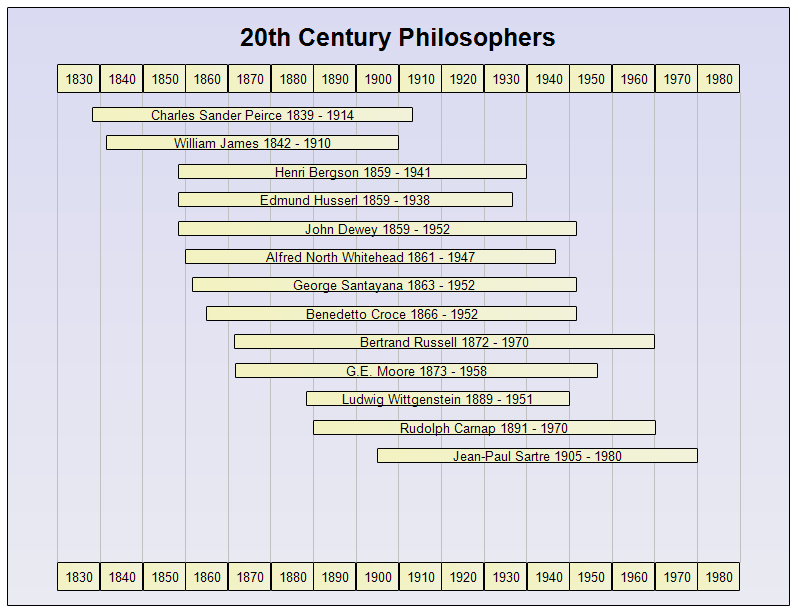 Once RFFlow is installed, you can open the above timeline in RFFlow by clicking on 20_century_philosophers.flo. From there you can zoom in, edit, and print this sample timeline. It is often easier to modify an existing timeline than to draw it from scratch. To generate this timeline from the data, download the text file 20_century_philosophers.txt Then run RFFlow and click Tools, Auto Charts, and Draw Timeline. Follow the instructions to open the text file and generate the timeline. To edit the data, run RFFlow and click Tools, Auto Charts, and Enter Timeline Data. Then open the text file. To draw timelines from scratch without downloading or generating the timeline from data, run RFFlow and click on the More Shapes button. Scroll to the Timelines stencil and click the Add Stencil button.